Oracle Buying into Open Source? Rule 2: Have a Long-Term Vision. Companies must take the long view in India. 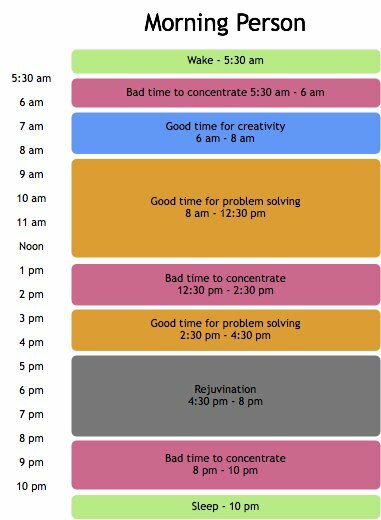 The typical time horizon for success must be between 3-5 years. Rule 3: Establish a Direct Presence. Having an Indian distributor does not count as entering the Indian market. 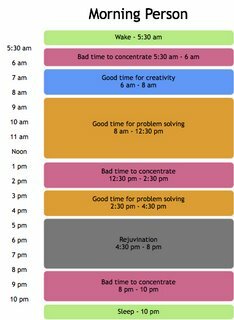 One of the key articles explores the best times of day for both “Morning People” and “Night Owls” to create, problem solve, rejuvinate and rest. I’ve re-worked the graphics presented in TIME for this post. How do firms compete with open source? What resources become critical in managing their growth? What strategies do they adopt to co-exist with dominant proprietary software firms? How do they interface with communities of practice to exploit network externalities? What strategies do they adopt to lock-in developers? You are currently browsing the Free to share your thoughts blog archives for February, 2006.